As you might have noticed the last week in this blog was quite quiet. 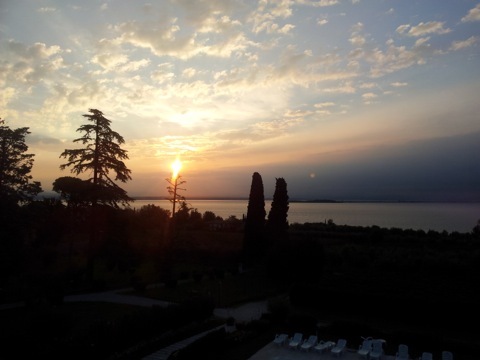 I spent it at Lake Garda, Italy taking it easy. This was my second trip to Garda and third to Italy altogether. I spent some time around Trapani, Sicily last year. If you are interested in my travel series, you might want to read my report on Madeira while at it. 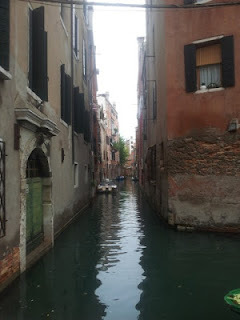 During our tour we visited various places around Garda and spent a day at Venice. In this post I'll go through some highlights. I will focus mainly on the western parts of the lake. The east is definitely worth a visit. Particularly Garda (the village), Bardolino and Malcesine are nice. The map above (not in RSS) shows the places I visited this time. There is a lot to see and experience even in late season. 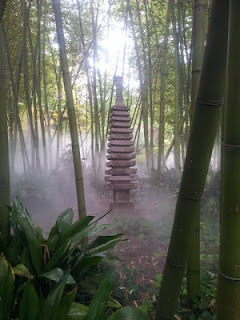 The weather wasn't as good as in my first visit and it was quite foggy at times. Still, the weather was better than in Finland during the last Summer and it barely rained even. It was quite apparent there had been a dry Summer. You could tell this just by examining the beach and markings at the rocks. I estimate the lake was missing around a meter of water. Here in Finland we have way more water than usually. I guess it will even out eventually. A week is pretty short time to spend in a place like this. You could spend an entire week exploring Venice and I think there still might be something to discover after that. If you like historical cities, you are bound to like Venice. It might not be the greenest place, though. This is actually something I like about Finnish cities. The nature is always there in some way or another. Our apartment was in a small village known as Moniga del Garda. The services available were actually quite versatile and there were many shops around. Unfortunately some of the beach routes were closed by gates or did not exist (map error). I guess Google Maps haven't caught up with some newer development. There were also some hazards (glass and such, spotted a rat too) on the pebble beach so take care if you decide to travel beyond the concrete route. Gardone Riviera seems like a nice place itself. I think what sets it apart is André Heller Park. It is a mixture of flora and art. There are supposedly over 2000 plants there. I think that's about believable. The park isn't a huge one but there is still plenty to see and explore. If you visit Gardone Riviera you just might want to pop in. Coastal promenade is quite nice as well and yields a nice view on Saló. Overall a good place to visit. As you might infer from the name Limone is a place known for its lemons. The coastal area is quite steep and filled with shops. It leads to a beach promenade where you can find restaurants and guess what, even more shops. A good stopping point. Riva del Garda is perhaps my favorite place in the Garda region. I visited there on my first trip as well. If you go there, be sure to climb to Bastione (at west), lake Tenno (at north) is worth a visit too. You will also find Varone Falls nearby. This time we happened to be at Riva on a market day so it was bustling with people. As you might expect, the city is filled with those tourist traps... err, shops. Many ways to get rid of your extra money. 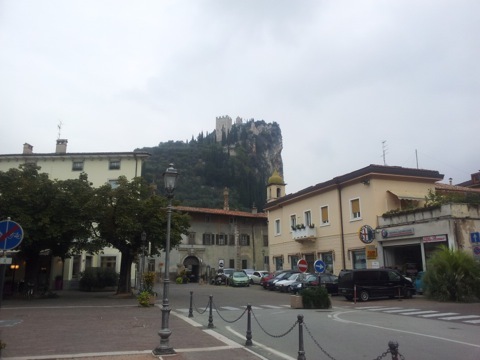 The village of Arco lies just five kilometers north of Riva. There is a nice little park in the center. You can also see the bastion of Arco from the center. The place is supposedly some kind of a climbing center of the world and they have some big contest (Rock Master) around there each year. So if you are into climbing, this might be a place to visit for you. Overall Riva and nearby Torbole should be good place to start your biking expeditions from. There are supposedly nice routes in the south too. Actually while at Riva I spotted a large group (around 30) of mountain bikers driving through the village. 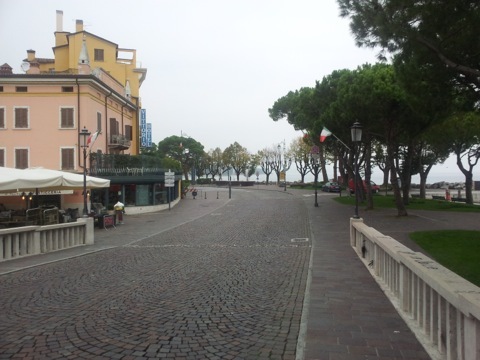 Desenzano is one of the biggest villages around Garda. The coastal area is quite nice as you might expect. There are railway connections available. You can easily get to Milan or Venice from here. And it's not too expensive either. It cost around ten euros to get to Venice in the regular train. There is actually a faster and more expensive one for those in a hurry. It's almost ridiculous how cheap it is to travel by train in Italy. If you are around Desenzano you should visit Sirmione. It is an ancient village built on a peninsula. There are historical sights (mainly grotto of Catullus and a castle) and atmosphere you might expect. Padenghe Sul Garda is located between Moniga del Garda and Desenzano. We went there looking for a market. Apparently it's open only during the Summer season. Nevertheless it was a nice visit. Venice was definitely one of those places that really impressed me. It was perhaps a bit too crowded for my tastes. But you could tell the city has some real history behind it. It might easily be the most beautiful city in Europe. You won'd find too much green there. I think the charm of the city lies in its architecture and culture. As you might well know the city has been built on a group of small islands. As a result it is filled with small alleys and bridges. It can be easy to get lost there without a map or preferably a GPS. Even still you might find yourself in a cul-de-sac. In a sense the structure of the city felt really chaotic. Unlike in many Western cities there was no clear grid to base your navigation on. It's just a mess of crisscrossing streets. Furthermore there are just four bridges that go past the great river separating various parts of Venice. It might be interesting to live in a city like this. Given there are no cars you pretty much have to walk everywhere or take a waterbus. I would not be surprised to hear people are really fit around there. No trip is complete without its share of difficulties. This was the first trip I took my Galaxy S2 on. As roaming costs are ridiculous (around a euro per megabyte) I ended up disabling data connectivity for the duration of the trip. Unfortunately this meant Google Maps routing didn't work anymore. It is possible to load maps for offline usage. It cannot, however, create routes offline. This is supposedly something they're currently in the process of fixing. It was possible to work around this issue by using WLAN connectivity to get the route done. I am sure there are many apps available that support offline routing as well. I also had some issues with map accuracy at times. Places weren't always where they were supposed to be or there were roads where there weren't any. I reported the issues I was having so hopefully they'll spend some effort in fixing those. There was plenty to see during this brief trip. The weather wasn't as good as it can be but I know it can be a lot worse. I think Fall is a nice time of year to visit Italy, particularly if you are used to a cooler climate. I guess spending four or so Winter months around there wouldn't be a bad idea. The cost of living is pretty cheap and weather adequate. In addition you don't have to deal with the darkness. I hope this post gave you some ideas where to visit at Garda. I know it was just tip of an iceberg. There is a lot you can see and do at Garda. I consider it a jewel of northern Italy.